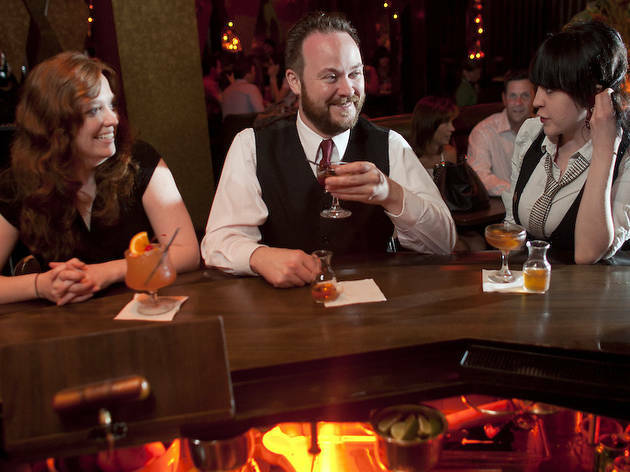 The city’s tiki lounges, classic cocktail bars and German beer halls are genuine classics. The light glows blue, the mood is somber, and the aging pianist at Angelo’s Piano Lounge (1686 N Van Buren St, 414-347-4144) is tired of young people and their ridiculous overuse of a particular superlative. 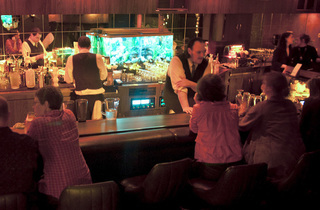 At the far end of the bar, a bushy-browed, mustachioed septuagenarian hoists himself onto a stool. John Dye, the Milwaukee bar owner who has brought us to this hangout—equal parts Rat Pack lounge and ’80s rec room—explains that this is Angelo Martellano, the bar’s owner and namesake. “When this particular person dies,” Dye says, referring to Martellano with awe, “this place will not exist anymore.” Martellano takes his place beside the piano and begins to croon George Gershwin: “Summertime, and the living is easy….” It’s a scene both enjoyably weird and just plain weird. The bar is nearly empty, and we’re the youngest people there by 30 years. Though this is the fifth and last stop on our tour of Milwaukee bars, we are also the least drunk. The night began with an ice-cream cocktail at the handsome, dimly lit bar Dye took over three years ago, Bryant’s Cocktail Lounge (1579 S 9th St, 414-383-2620). Ice-cream cocktail? “It’s so Wisconsin I don’t want to talk about it,” Dye replies, laughing. He continues: “A lot of these drinks started as cream-based drinks. I think they just added ice cream just ’cause it’s such a Midwest thing.” There is no cocktail menu at Bryant’s, which opened in 1938, but the bar has an archive of more than 400 recipes, a portion of which are ice cream–based. That doesn’t necessarily mean they’re drinkable desserts, though. “Some of them are really sweet and fruity, and some of them are a little more serious-tasting,” says Dye, 36, who grew up in Montana and moved to Milwaukee from Seattle ten years ago. “They vary from herbal to fruity to chocolatey.” The bar also serves Depression-era cocktails (on-the-rocks drinks, such as old-fashioneds), tiki-inspired drinks (hurricanes, mai tais), classic cocktails (such as Sazeracs) and many original creations. Enjoy them, but don’t ask too many questions: The original owner, Bryant Sharp, wrapped the bottles in aluminum foil to disguise his ingredients; Dye, for his part, is easy to talk to about pretty much anything—except what goes into the cocktails. 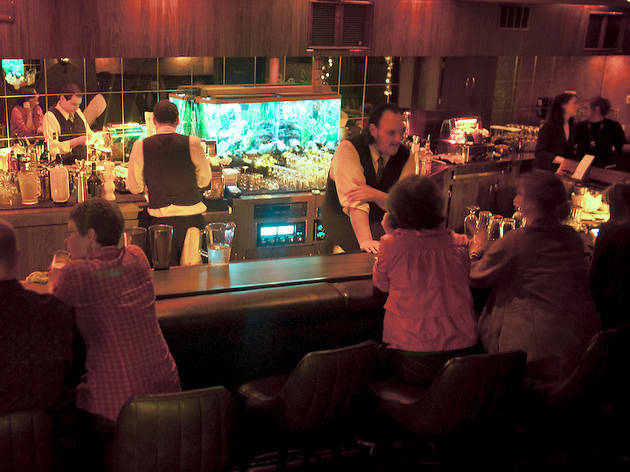 Bryant’s is a treasure—a cocktail lover’s time capsule outfitted with leather banquettes, gold-plated antique cash registers and twinkling Christmas lights, every detail remarkably preserved. It’s the kind of bar you never want to leave. But tonight, we have to. This is Milwaukee, and the beer isn’t going to drink itself. 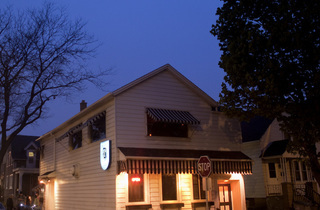 From the historic Mitchell Street neighborhood (an $11 cab ride from downtown), we head across town to Von Trier (2235 N Farwell Ave, 414-272-1775), a German pub on the East Side. 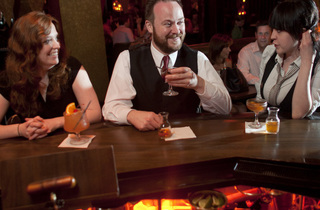 Along the way, we pass two sophisticated new cocktail lounges, both meant to evoke grand, vintage hotel lobbies: First, the Hamilton (823 E Hamilton St, 414-223-1020), where Violet Hour alum Ira Koplowitz created the impressive drink menu with his business partner, Nick Kosevich (the pair run Bittercube, a bitters-making and consulting company); second, Hotel Foster (2028 E North Ave, 414-988-4758), a month-old, elegant space decked out in vintage furniture and serving classic cocktails. We peek in the window of Hotel Foster, then head around the corner. “The original owner was shot through the heart with an arrow,” Dye says before we head into Von Trier, one of the bars Dye comes to on his nights off. Judging from the German country–lodge setting—Tiffany-style lamps, ample antlers, decorative beer steins, faux 18th-century portraiture, triangular beer garden and two-dozen taps, split between German and Belgian imports and local microbreweries, such as Milwaukee’s Lakefront Brewery and Sprecher Brewing Co.—I imagine this happened during, like, the pioneer days. After a pint and many helpings of complimentary popcorn set out on the bar, I learn that it happened in 1981. “It’s kind of morbid, but, you know, whatever,” the bartender says, fiddling with a commemorative arrow set behind the bar. When my friend gets up to use the restroom, an older regular unceremoniously takes his bar stool. We consider saying something, but it seems as if this older gentleman probably has some serious affinity for this particular stool, so we head out for a quick bite at Classic Slice Pizza (1609 E North Ave, 414-270-1880)—none of the bars we’re going to serve food, which Dye explains is typical for Milwaukee—and then the next stop: Foundation in Riverwest. 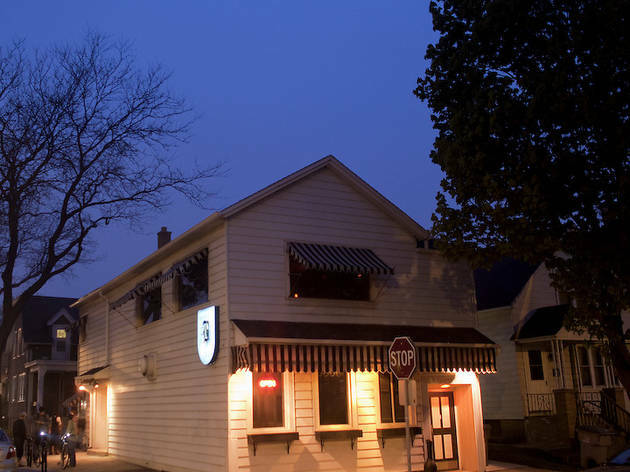 Tell someone familiar with Milwaukee that you’re heading to a punk-slash-tiki bar and they’ll immediately know Foundation (2718 N Bremen St, 414-374-2587). Formerly a punk bar, it’s been “gradually overtaken by tiki,” Dye explains as we perch beneath illuminated fish in the obsessively decorated island-kitsch paradise. Doctor Fu cocktail in hand (it’s rum-based, with a strong anise hit from Pernod, served in a politically incorrect collectible mug depicting an Asian man for $12), I’m obsessed with this place: Foundation is the closest thing Chicago/Milwaukee has (apart from Hala Kahiki) to classic tiki lounges like San Francisco’s Tonga Room—and a small stage for live music is being added to the back room.